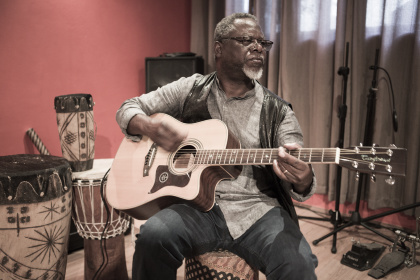 José Mucavele’s distinctive voice is well-known and well-loved in Mozambique. It’s a warm, sonorous, lived-in voice with a soulful burr, accompanied by his deep-toned, free-rolling guitar playing. In over 45 years of music-making he has released just three albums of his own songs but his most famous composition, ‘Balada para as minhas filhas’ (Ballad for my Daughters), has been heard around the world after its adoption as an anthem by UNICEF. 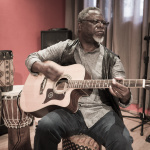 He has devoted many years to ethnomusicological investigations, travelling and collecting songs, rhythms and styles from the rich musical heritage of Mozambique. He has introduced these traditional elements into his own music, blending them with urban genres to create his unique acoustic style which has influenced many other popular music artists. José Mucavele is a fully-qualified Mozambican music legend.